Find the best Japanese ramen in Ikebukuro, Tokyo, selected by a ramen fan who has eaten over 5,000 bowls! With so many restaurants, Ikebukuro is one of the best places to get high-quality ramen! 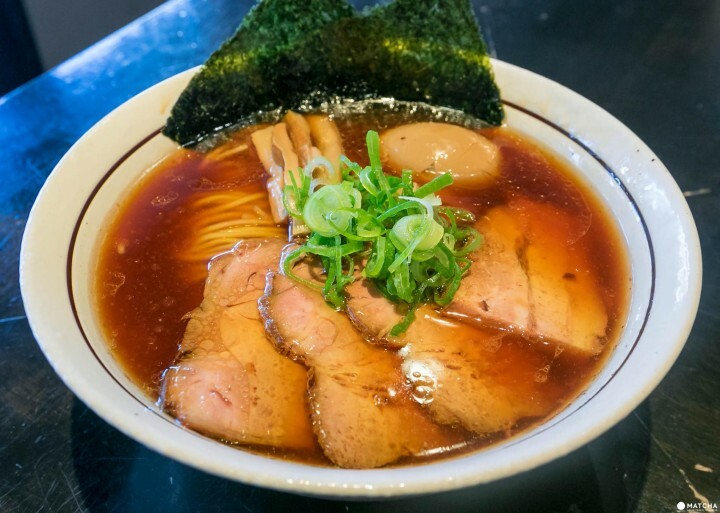 Read this article to see where to go for ramen. There are many ramen shops in Tokyo, but Ikebukuro likely ranks the highest when it comes to the number of establishments. With so many places to choose from, it is hard to decide where to eat in Ikebukuro. This time, we will feature truly delicious ramen in Tokyo, taste-tested by a ramen enthusiast who eats nearly 900 bowls annually, consuming over 5,000 bowls total. Out of the many ramen shops in Ikebukuro, the one that has captured our MATCHA writer's heart is Chuka Soba Shinagawa. Their staple ramen is the Chuka Soba seen in the picture above. The picture displays a special version with additional char siu and flavored egg topping. It costs 1,000 yen with tax. It is a classic shoyu ramen (soy sauce-based ramen), but the noodles, soup, and toppings are all top-quality. Even standard, no-thrills ramen can taste this delicious when made properly. The homemade noodles are exceptional, and you can get an additional medium size serving for free. While Chuka Soba Shinagawa is a bit of a walk from Ikebukuro Station, it is definitely worth the visit if you are a ramen fans Please note that the menu changes between day and night. You can only enjoy the ramen pictured above during the daytime. It might be hard to believe Men-ya Hulu-lu is a ramen shop from its exterior and the interior decoration, but it is a very popular, high-quality ramen shop. Their staple dish is the shoyu (soy sauce) ramen and the shio (salt) ramen. Our writer personally recommends the Shoyu SOBA shown above (790 yen with tax). The soup uses chicken broth, and tastes light while maintaining richness. It pairs well with the homemade noodles which are made using water from Hawaii. With one bite you will understand why people line up to feast upon this ramen. It is highly recommended to order the value combo meal with the spam onigiri (rice ball) as a side to accompany your ramen. At Hulu-lu, they also have a variety of limited edition ramen that can be seasonal or only for that day. Our writer personally recommends the dipping noodles available Friday, where you can savor the delicious homemade noodles. Nearest station Ikebukuro Station on JR and other lines. Access 10-minute walk from the West Exit of the JR Ikebukuro Station. The most unique ramen in Ikebukuro out of the spots we are introducing is at Men-ya Rockan-do. From the large variety of options on the menu, try the Shio Green shown above (with flavored egg and char siu added, 1,200 yen with tax). Unique to this ramen are the green homemade noodles, which have Euglena blended in them. The high nutritional value of Euglena adds of a lot of impact to the bowl. The soup is an all natural, Japanese-style dashi broth containing no artificial flavoring. The noodles and soup are both delicious and healthy. This is a perfect ramen to recommend for those who are health conscious. Men-ya Rockan-do makes an effort to creating limited edition ramen, and you can try different ones depending on weekdays or weekends. One of the great things about this spot is that you can enjoy something different every time you go. Business Time Weekdays: 11:30-15:00, 17:30-21:00. Weekends and Holidays: 11:30-21:00. Access 7-minute walk from the East Exit of Ikebukuro Station. Tori no Ana specializes in Tori Paitan (*1) ramen, a variety rarely found in Ikebukuro. The basic dishes here all use a tori paitan soup base. We recommend trying the Paitan Ramen if it is your first time eating at this shop (740 yen with tax). While this ramen has a thick and rich soup, it is very easy to eat and doesn't smell like chicken or taste oily. The char siu topping is also chicken. It isn't a particularly unique ramen, but it is definitely a ramen you can safely recommend to anyone. Along with the delicious ramen, Tori no Ana is a hospitable restaurant that lends out umbrellas on rainy days. The limited edition ramen offered monthly is not to be missed. *1 Tori Paitan: A white soup made with chicken cooked for many hours. It looks like pork broth but tastes different. Fixed holidays Open all year. Access 5-minute walk from the East exit of Ikebukuro Station. Mendokoro Hanada Ikebukuro Branch is a popular miso ramen shop with a line out the door in Ikebukuro. While many ramen restaurants try to keep their clientele by adding new dishes, this shop sticks to the two basics: miso and spicy miso only (pictured is miso ramen for 830 yen with tax). With a thick, rich soup that adheres well to the noodles, by the time you finish eating there will barely be any left. You will taste the strong flavor of the broth with your first bite. It has an irresistible taste for miso ramen lovers. The noodles also have a nice firmness that match perfectly with the soup. Additional garlic and vegetables are offered free of charge on weekends. During the lunchtime on weekdays, they offer half-sized rice for free. This is is a fulfilling ramen meal you can enjoy in Ikebukuro, popular with those with big appetites! Fixed holidays Beginning and end of the year. Access 6-minute walk from Ikebukuro Station. Those craving some rich tsukemen dipping noodles in Ikebukuro should visit Veggie-Pota Tsukemen Enji. They offer standard ramen here as well, but be sure to try their signature Veggie-Pota Tsukemen (800 yen with tax). There is a distinctive thickness to the soup from the blended vegetables in the rich soup base made from pork and fish. However, it is not too fatty nor overbearing to diners. You can choose from two types of noodles, but we highly suggest trying the nutritious noodles made with wheat germ, pictured above. You can taste the great flavor of the noodles, which go perfectly with the soup. The normal portion is pretty filling, but for those who want to eat more, we suggest the free large portion upgrade. This ramen shop has a line, but their service is fast so you will not wait too long. Business Time Weekday 11:30-16:00, 17:30-23:00. Weekends and holidays 11:30-22:00. Access 4-minute walk from the North Exit of Ikebukuro Station. The tsukemen is light, made with chicken broth and soy sauce based soup. The noodles are thick, homemade noodles that have a great texture and are extremely tasty. The way the soup matches with the thick noodles is simply delicious, giving you an amazing dining experience. With convenient access from Ikebukuro Station, families with baby strollers and wheelchairs are able to come in and savor a bowl of delicious ramen. For those who are hesitant in going to popular ramen shops with lines out the door, this is a perfect spot to casually eat some great ramen. Access Inside Tobu Hope Center in the underground shopping area of Ikebukuro West Exit. On the southern side of S-15 area. This unique ramen at Karashibi Miso Ramen Kikanbo Ikebukuro Branch blends the spiciness of pepper and the mouth-numbing sensation from sansho peppers (Japanese peppers). This ramen shop simply offers Karashibi Miso Ramen (800 yen with tax) along with some side dishes. Not only is the spiciness and the numbing sensation very addicting, but the soup base has depth that is very delicious. Not only is it unique, but it is a well-constructed ramen. After tasting it you will understand why it is so popular. You can also choose from five levels of spiciness and numbness for the same price, with the exception of the top level. This shop is popular among travelers in Japan, and at times there may be more out-of-town visitors than locals! Please note that there is normally a line out the door, and you may end up waiting for quite a while. Menu/Pamphlets in Other Languages English text on the vending machine. Access 7-minute walk from Ikebukuro Station East exit. Tsukemen-style ramen is quite popular now, but it is said that tsukemen first started by the founder of Higashi Ikebukuro Taishoken Main Branch. At Higashi Ikebukuro Taishoken Main Branch, people refer to the tsukemen as morisoba (750 yen with tax). The sumptuous soup is made using pork, chicken, fish, and other ingredients, and is thought to be the base of the current tsukemen. The aftertaste of the refreshing, sweet vinegar is wonderful. The smooth, homemade noodles are quite filling and the normal portion is quite voluminous. If you order a large portion, you may not be able to finish it all. Higashi Ikebukuro Taishoken Main Branch also has a wide variety of toppings, including the classic char siu and flavored egg. They also serve adult beverages and sides dishes. We suggest having a drink before indulging in a bowl of delicious ramen or tsukemen! Access 1-minute walk from exit 6 or 7 of the Higashi Ikebukuro Station on the Tokyo Metro Yurakucho Line. Shinasoba Tanaka is a popular ramen shop in Higashi Ikebukuro, owned by a handsome surfer. The ramen here is based around seafood and fish. The staple here is the Aji nibo Soba shown above. The picture shows a special version that includes char siu and flavored egg (950 yen with tax). The soup does not use any pork or chicken and is made using only fish broth. It is a mildly thick soup and has a unique finish. With a bold fish flavor, it has a satisfying taste without relying on ingredients like pork bone. We suggest ordering additional nori (seaweed) topping which pairs well with the soup. At Shinasoba Tanaka, you can try limited edition ramen flavors on different days. They have a great lineup of beverages and snacks as well. How about winding down at the end of the day with a drink and some ramen? Tonchin Ikebukuro offers popular tonkotsu pork broth ramen and has a long history in Ikebukuro. Unlike the famed tonkotsu ramen in Hakata, they offer a unique Tokyo style tonkotsu ramen (680 yen with tax). The soup is made using a pork bone base with additional chicken and vegetables. It does not have a strong aroma or greasiness, and has a flavor that is mild and easy to eat. The thick homemade noodles that are not commonly found paired with tonkotsu ramen add something special to the dish. These noodles can be made into a larger portion for free. Along with the larger portion, you can also receive a side of rice free of charge, making Tonchin one of the most cost-friendly ramen shops in in the neighborhood. The friendly employees here also showcases why they have been in business for such a long time in the competitive area of Ikebukuro. Access 5-minute walk from Ikebukuro Station. Mendokoro Shinohara is a popular ramen shop in Ikebukuro, with a line outside the door starting even before they open. The ramen here uses fresh seafood and has generous char siu toppings. The picture shows their Tokusei Shoyu Soba for 1,050 yen with tax. The soup uses mainly red snapper and shellfish. It is light, yet has a nice boldness that makes it phenomenal. It has a refined taste and the soup brings out the best of the ingredients. The char siu cooked at a low temperature is moist and has a juicy texture. It is definitely worth getting extra to enjoy. Another dish worth trying is the red snapper paitan soba, which has a paitan chicken-base soup that is blended with red snapper. The limited time ramen that is served on a random basis is also wonderful and has created many fans. Access 10-minute walk from the West exit of Ikebukuro Station. You can enjoy a bowl of rich but healthy ramen free of artificial flavoring at Miharu Ikebukuro Branch. They have a selection of ramen, tsukemen, and abura soba (broth-free noodles) here, but the most popular dish is the abura soba shown in the picture (830 yen with tax). The rich sauce has a bold seafood taste leaves an impression. The all-natural flavor leaves an impact and is simply delicious. It is seasoned with scallions and onions, creating a refreshing taste that will make you crave more. A flavored egg accompanies the noodles, which we recommend mixing with the noodles. The char siu and menma (bamboo shoots) pickles are a personal favorite of our writer. They are good as a ramen topping, as well as when paired with beer. The squid ink dry curry is also wonderful side dish and definitely worth a try. Business Time Monday-Friday 11:00-15:30, 17:00-22:00. Weekend and holidays 11:00-22:00. Located slightly away from the West exit of Ikebukuro Station is Uchi, which, despite being difficult to find, has a loyal following from customers. They provide ramen and tsukemen with pork and fish based soup. Their staple item is the Chuka soba seen in the picture (700 yen with tax). Oiliness aside, you can taste the great flavors of the ingredients in the soup, which contains a subtle sourness and sweetness. While it is rich, it is a ramen with a delicious taste. The medium thickness noodles match well with the soup. You can upgrade to a larger portion for free. Great service is also part of the appeal of Uchi, which has a relaxing, at-home feel. Along with the free noodle upgrade, you can also get a free bowl of rice, making this a perfect place to visit when you are especially hungry. Rokubou TanTanMen is a popular tantan men (noodles) specialty restaurant that competes against the many ramen shops in Ikebukuro. This shop provides two types of tantan men: classic Schezuan style and noodles arranged for Japanese tastes. The photo here shows the Japanese-style tantan men without soup (830 yen with tax). With ground sesame as a base, Rokubou uses a blend of many spices and chili oil that makes pair well with the thick, chewy noodles. While you can select from six levels of spiciness, the highest level of spice is still tolerable. Those who have a high spice tolerance can most likely eat it without a problem. The recommended way to enjoy this dish is is to sprinkle on garlic and black vinegar to change the flavor as you are eating. For an additional fee, adding an onsen tamago (hot spring eggs) is also great. When you finish eating all the noodles, order some rice to add to the remaining ground meat and sauce to savor the dish completely. Access 3-minute walk from East exit of Ikebukuro Station. Here we introduced the popular ramen shops of Ikebukuro, one of the most competitive areas for ramen in Tokyo. If you are looking for great ramen establishments to eat at in Ikebukuro, be sure to use this article as your guide!